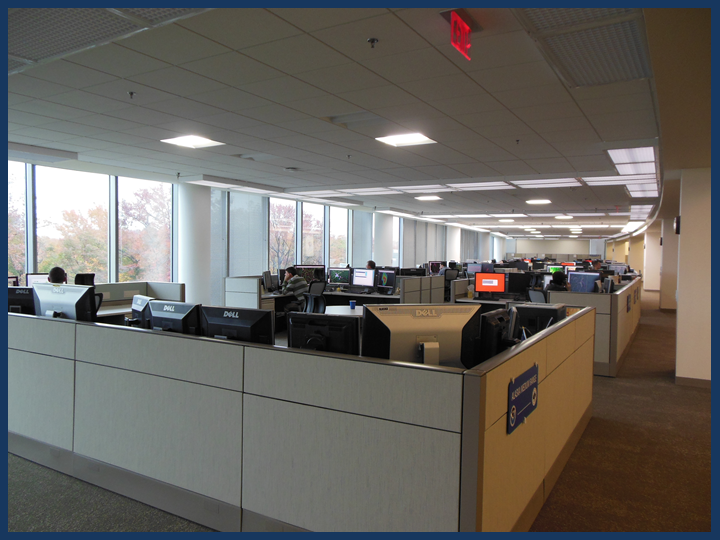 Check out WPC's new interactive virtual tour! rainfall over the region within a slight risk for flash flooding. Basin into the Central Rockies on Thursday evening into Friday. morning moving into the Northern/Central Rockies by Friday evening. Plains, Mon-Tue, Apr 29-Apr 30. 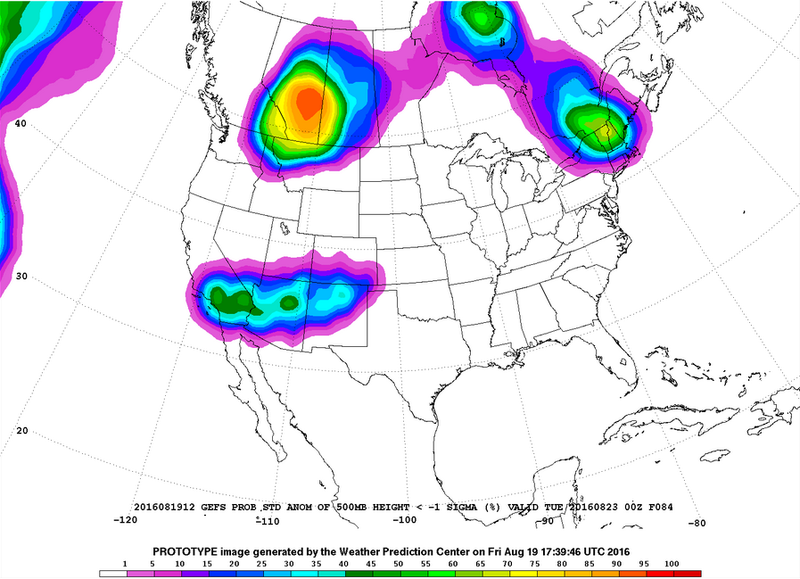 Mississippi Valley, and the Southern Plains, Wed, May 1.
the Northern Rockies, Sat-Wed, Apr 27-May 1. 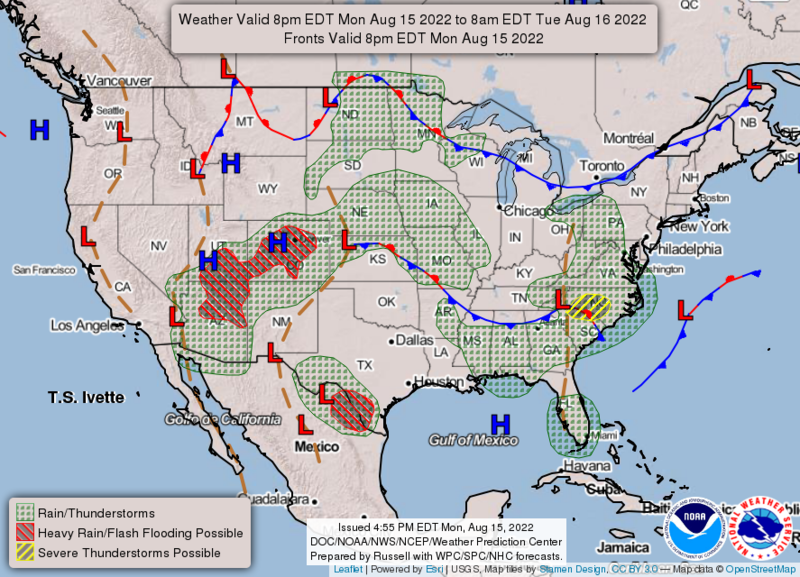 - Flooding likely across portions of the Northern Great Basin. another closed low to the northeast of the state next Wednesday. northeasterly flow in its wake and a drying trend from NW to SE. taking a more southern track across Central to Northeast Texas. runoff issues possible...with a marginal risk area maintained. amounts on Day 2...with greatest amounts closest to the coast. northeast along and ahead of trough in the northern stream. North Carolina to central/Downeast Maine. central and southern Minnesota and central Wisconsin on Saturday. transition from rain to snow. These tools are NOT operationally supported. 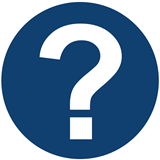 Data may not update regularly due to workstation failure and/or data unavailability. Change in weather parameters (temperature, dewpoint, surface pressure, etc) over the last 1/3/6/24 hours. 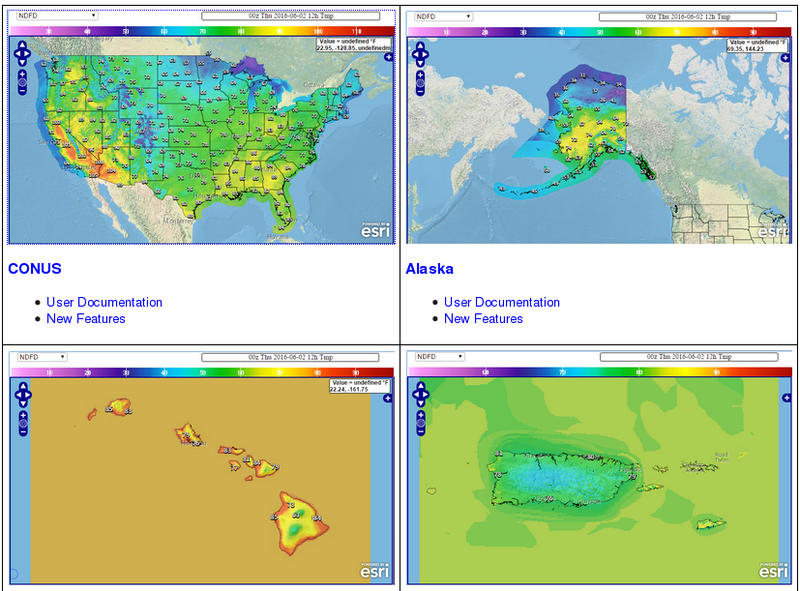 Data is provided from the Real-Time Mesoscale Analysis (RTMA) or the Rapid Refresh (RAP). 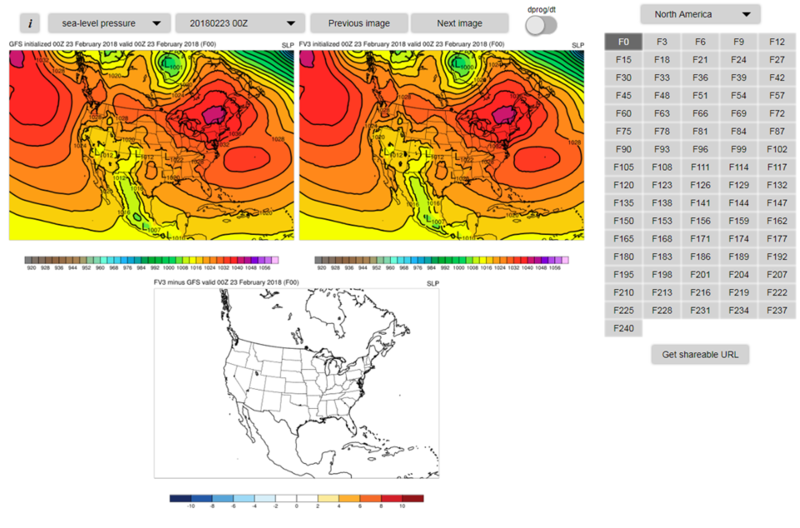 Plots of GEFS probabilistic forecast of precipitation, temperature, and sea-level pressure exceeding various thresholds. 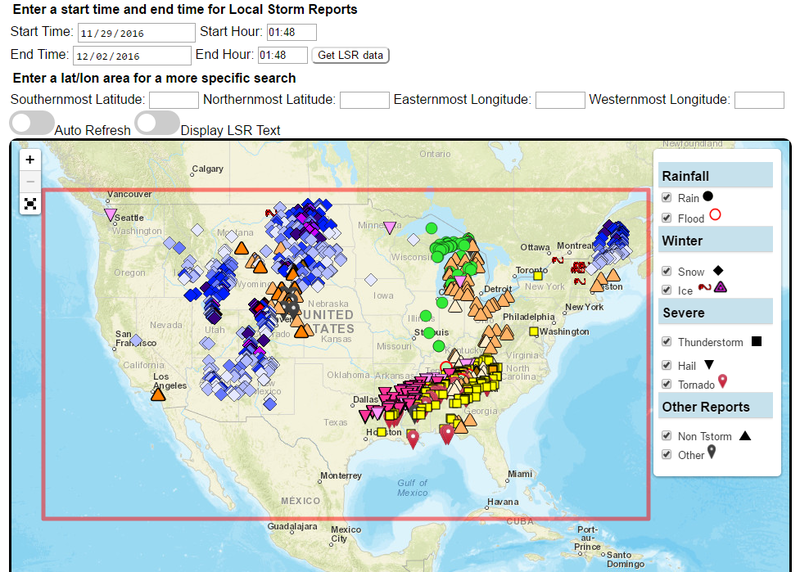 Custom plots of Local Storm Reports across the Contiguous United States. Reports include rain, snow, ice, and severe weather, as well as other significant information from storm spotters. 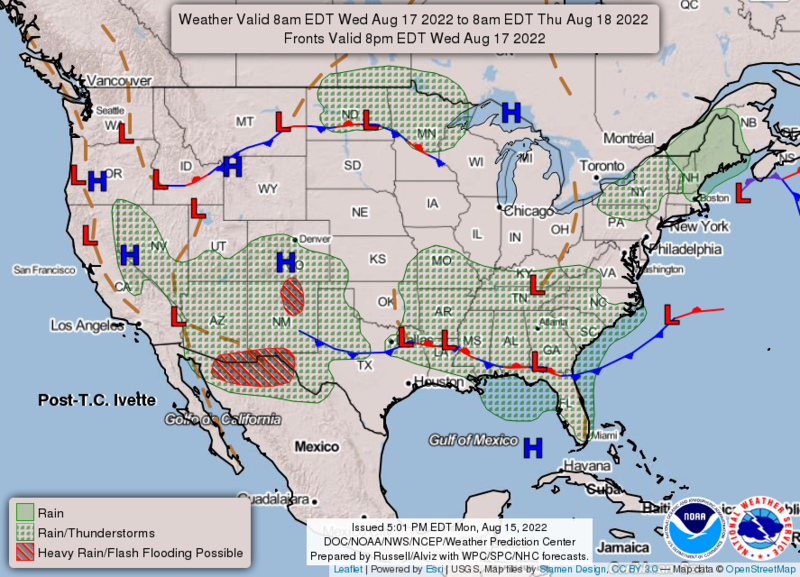 Displays the climatological significance of precipitation forecast by WPC. The climatological significance is represented by Average Recurrence Intervals (ARIs) of precipitation estimates from the NOAA Atlas-14, NOAA-40, and Atlas2. 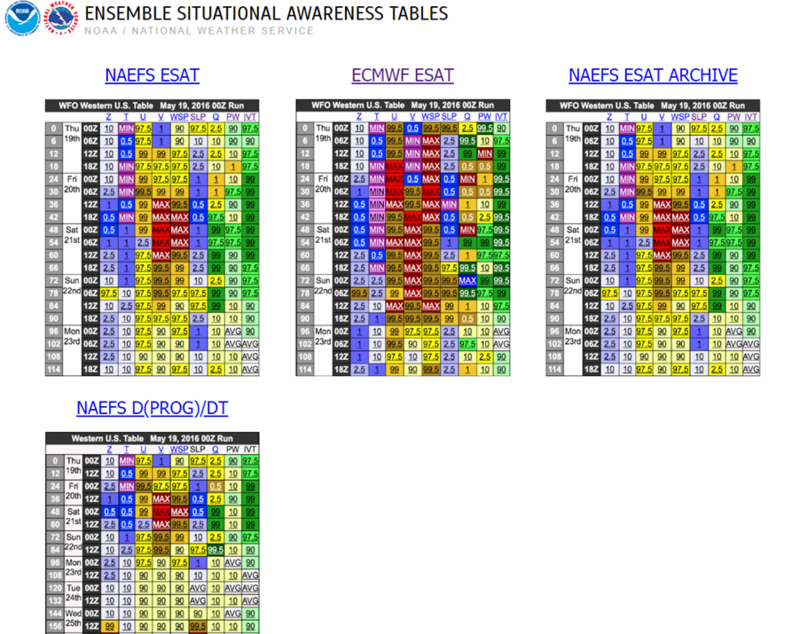 An interactive situational awareness table that displays anomalies, percentiles, and return intervals from the GEFS, NAEFS, and ECMWF Ensembles (login required to view ECMWF data). 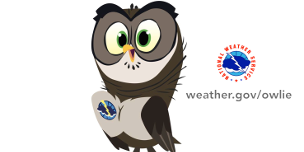 *Please note that there is currently an issue where only users on a NOAA network can access this page. We are actively working to resolve this problem. 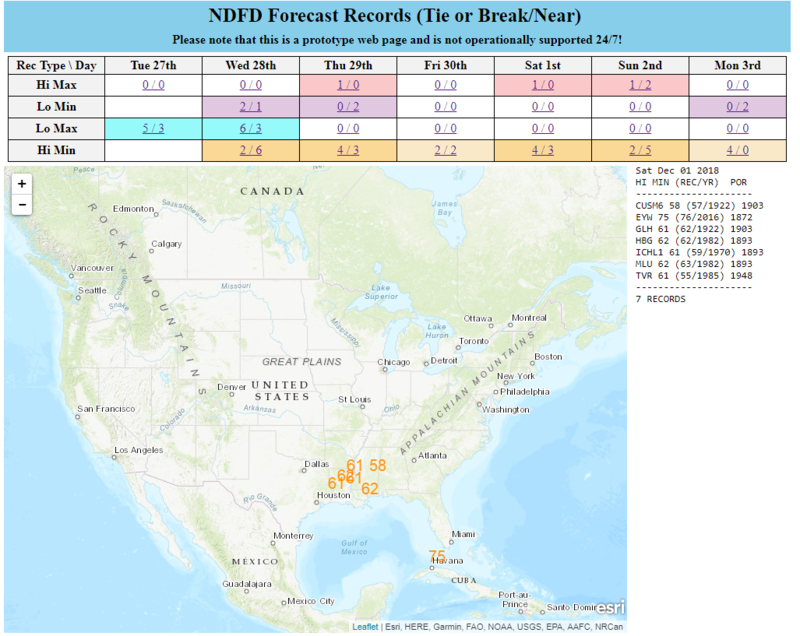 Displays Days 1-7 NDFD maximum and minimum temperatures, along with their respective departures from climatology. 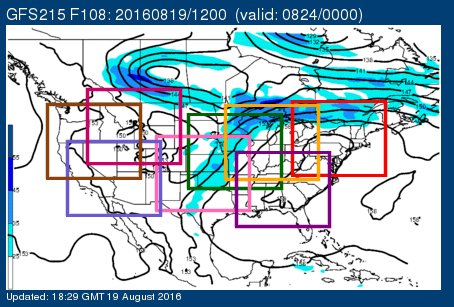 Analog guidance that uses an objective approach to find historical events that are similar to the upcoming forecast. 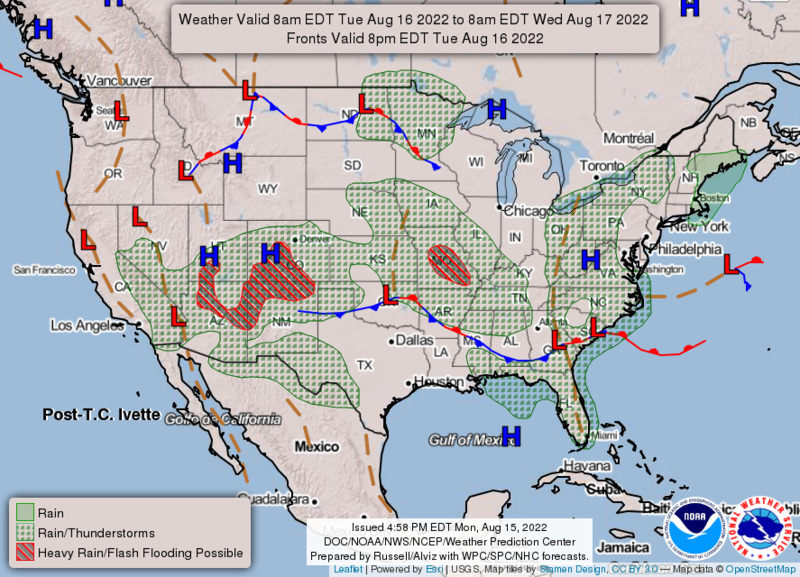 Nationally consistent and skillful suite of calibrated forecast guidance based on a blend of both NWS and non-NWS numerical weather prediction model data and post-processed model guidance. 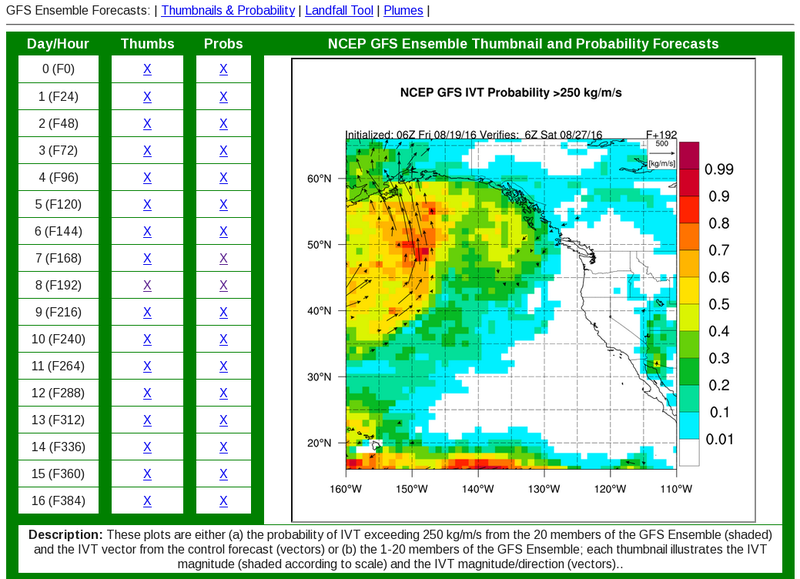 A portal for atmospheric river forecasts and diagnostics from the GEFS. 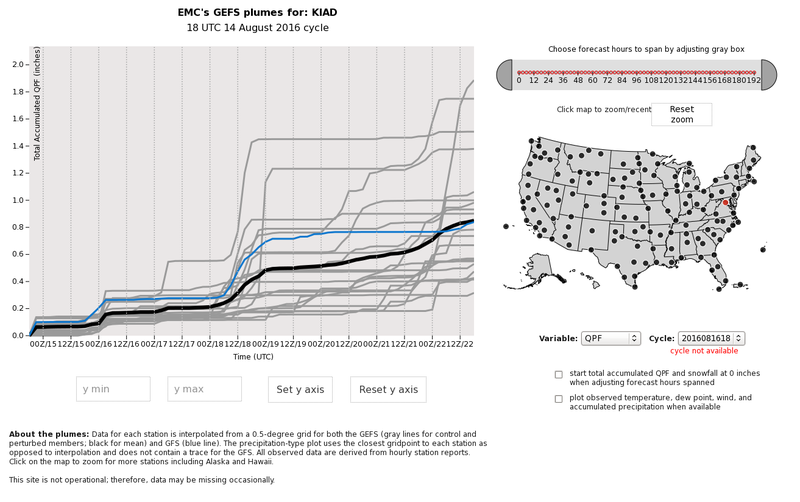 An interactive display of time series plots from GEFS ensemble members at a point. 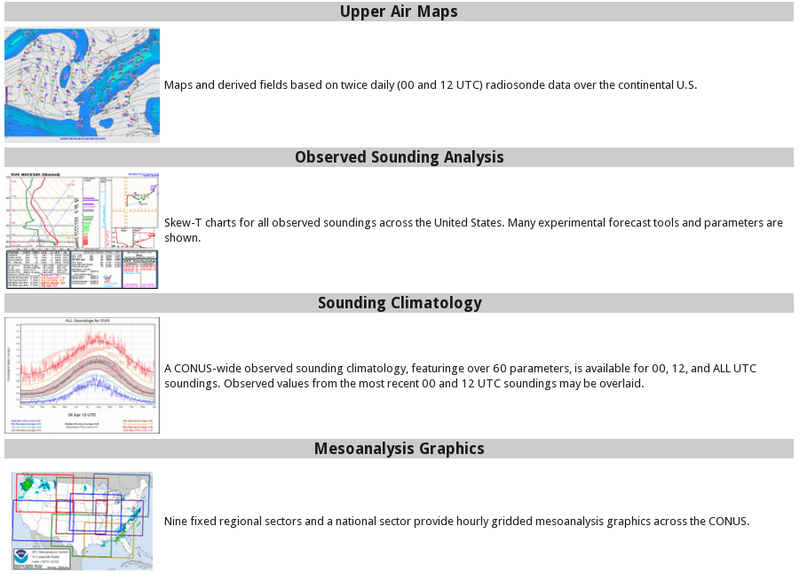 A variety of useful tools generated at The Storm Prediction Center (SPC). 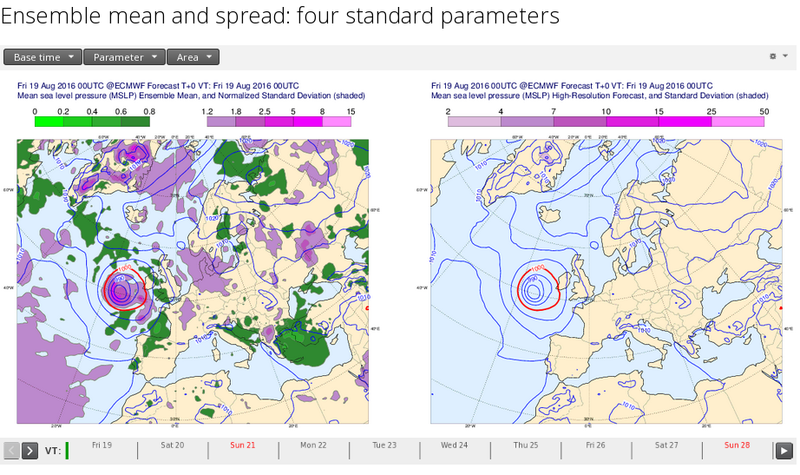 Output from the ECMWF 'Ensemble Prediction System' (ENS) for four parameters: mean sea level pressure, 850 hPa temperature, 850 hPa wind speed, and 500 hPa geopotential height. An interactive comparison of the GFS and FV3.